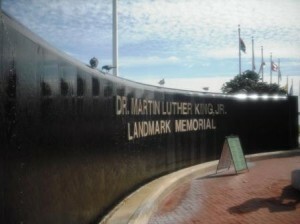 Completed in 2004 and visible from Flagler Drive in West Palm Beach is the Martin Luther King Jr. Memorial Landmark commemorating the life of Dr. Martin Luther King, Jr.
Born on January 15, 1929 in Atlanta, Georgia, he was a Baptist minister and a great man of faith who led the Civil Rights Movement in the United State until his death by assassination in 1968. Through non-violence and peaceful protests, he fought for equality and the end of discrimination for African Americans. He was awarded the Nobel Peace Prize in 1964 and is remembered as one of the most influential African-American leaders in history. With his famous speech “I have a dream” delivered in Washington D.C., he described his dream for freedom and equality from a land of slavery and hatred. Every year around his birthday, the U.S. observe Dr. Martin Luther King Jr. day as a federal holiday. The Martin Luther King sculpture was created by a very talented artist Steven Dickey of Tampa, Florida. 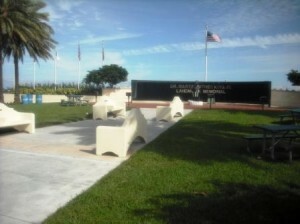 The West Palm Beach Martin Luther King Jr. Memorial Park was completed in 2004. 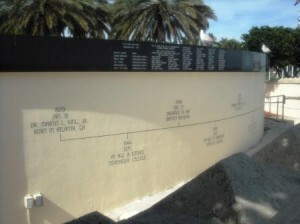 There are several benches leading up to the memorial wall. At the center is a large bronze sculpture of Dr. King with the Holy Bible with cascading water on a curved granite wall behind him. On the wall as well as behind it are several quotes of people and events from Dr. King’s life and the civil rights movement. 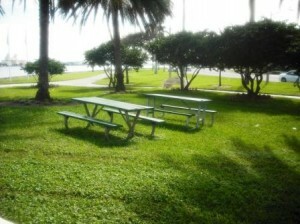 You also have the beautiful Intracoastal views in the background and benches to sit and reflect. 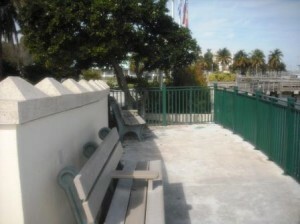 There is a long paved walkway that extends along the Intracoastal from the MLK Memorial to the Palm Beach Maritime Museum all the way to Currie Park‘s parking lot. 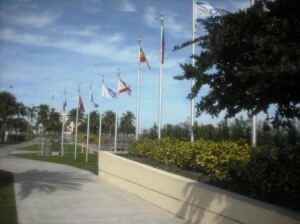 Parking also available on North Flagler Drive directly in front of the MLK Memorial. 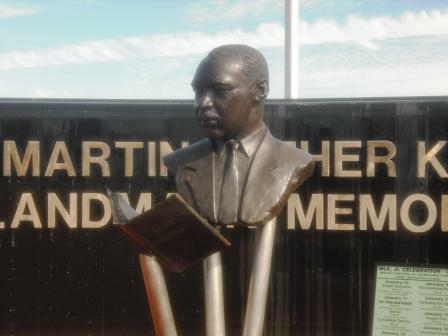 Take some time by yourself, with children and family members to remember Dr. King and visit one of the best MLK memorial in Palm Beach County.